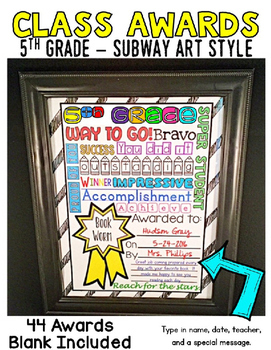 This pack of creative subway style end of year awards is for 5th grade ONLY. Each award says 5th grade. These awards have several lines for you to add your own special short message. 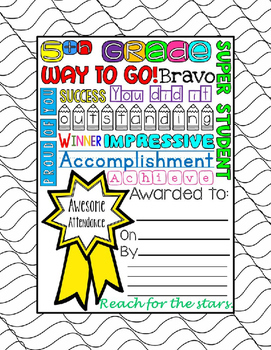 These end of year awards are perfect for recognizing students for their accomplishments. There are 44 predetermined awards and a blank award if you would like to recognize a student for something different. These awards look best when printed in color, but you can set your printer to black/white if you choose. A few things to know about these end of year awards before you buy. Each award also has the words/phrases "way to go, bravo, super student, you did it, outstanding, winner, impressive, accomplishment, proud of you, achieve, and reach for the stars"
There is a yellow ribbon on each award with a specific award/accomplishment. This is what makes them individualized. See the list below of the awards included. You can create text boxes on top of the award, but you can NOT change any of the images or text preprinted on the award. There are blank lines to type a special message. This can be any message or something that goes along with the award they are receiving. For an example, see the preview image. These awards can be placed in a frame from the Dollar Store, or you can laminate them, punch holes, and add a ribbon. They can then be displayed as a keepsake. You can also just pass them out without doing anything fancy to them. If you are shopping for a frame, you may want to take one copy of the award with you. You may have to trace around and trim the award to get it to fit perfectly. The one in the preview actually fit perfectly into the frame without trimming. End of Year Awards in this pack. ***********This end of the year award pack is saved as a powerpoint. You will print it like normal, but the good part is that you can open the file and add your own text by creating text boxes. You do this like you would with any powerpoint. Just create a text box, choose your font, and type. If you are not sure how to do this, CLICK HERE to read a blog post I wrote detailing the steps. 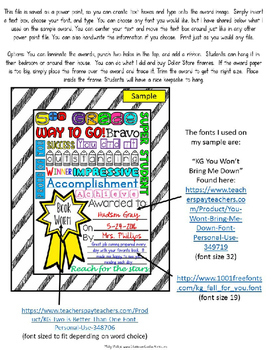 On each award, you can type the child's name, date, teacher name, and a special message. 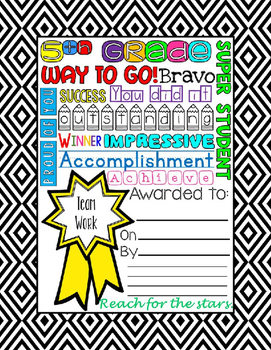 Your kids are sure to love these award keepsakes, and the good thing is that you can print and use year after year!!! You may also like these award packs. CLICK HERE for my Super Hero Award Pack- Awarding Super Powers!! For more creative lesson ideas, click on 'elementary lesson plans' by my picture above.